The home city of the world-famous Ernest and Julio Gallo Winery welcomes the annual spring running of the Sutter Health Modesto Marathon, Half Marathon, 5K & Relay race in 2019, along a combination of the city’s residential neighborhoods, urban parks and the campus of Modesto Junior College for an event that will also serve as a fundraiser for the local nonprofit Teens Run Modesto. Both the half and the full marathons will share the same starting line and time, at 7:00 AM in downtown Modesto near the intersection of 11th and M Streets. From there, runners will follow what is roughly an out-and-back, mostly flat course with a brief loop in the first few miles, which take runners along M Street, Needham Street and Park Avenue for the first stretch that runs through the city’s Enslen Park, whose history dates back more than a century and was designed by John McClaren, the designer for San Francisco’s Golden Gate Park. The first and second miles next take runners through the neighborhoods along Sycamore Avenue, Mensinger Avenue and Enslen Avenue before turning onto Griswold and then Princeton Avenue, which marks the start of a long, steady and gradual descent from the starting line elevation of just below 90 feet above sea level to about 65 feet by the time runners reach just past the half-way point of the race. After hitting the low point just after the middle of the race, runners then have an equally gradual climb back up in elevation over the next several miles in to the race finish. Along the way, runners pass by both campuses of the college on the way out to the half-way point, along both 9th Street and Brink Avenue, which they follow as it makes its way northwest toward the San Joaquin National Wildlife Refuge, where runners taking part in the full marathon will be able to catch a glimpse of California’s Diablo Mountains off in the distance. This section of the course also offers a stark contrast from the earlier miles, organizers add, as runners making their way along North Avenue are surrounded by wide-open farm fields and scenic orchards, a break from the downtown neighborhoods earlier in the race. Those running the half marathon reach their turnaround point just after passing the mile 7 marker near the intersection of North Avenue and Finley Road, and from there begin the steady, gradual ascent back toward the start/finish line area. Walkers are permitted in both the 13.1-mile half marathon and the 26.2-mile full marathon, and participants in both events will have seven hours to complete their race, which finishes near the race’s host hotel, the Doubletree Hotel/Modesto Convention Center. Located in the Central Valley region of Northern California, roughly 90 miles east of San Francisco and just over 65 miles east of Yosemite National Park, the city of Modesto typically experiences some of its mildest weather conditions of the year during the month the race is held, and is generally wetter in the winter and spring than in the summer, when the area sees almost no rainfall. On race day (March 31), the average low is 48°F and the average high is 70°F — while rainfall totals average about 2.3 inches for the month. See the race route map for the Modesto Half Marathon here. To reserve your spot in the spring 2019 running of the Modesto Marathon, Half Marathon or 5K race, register online at ImAthlete.com here. 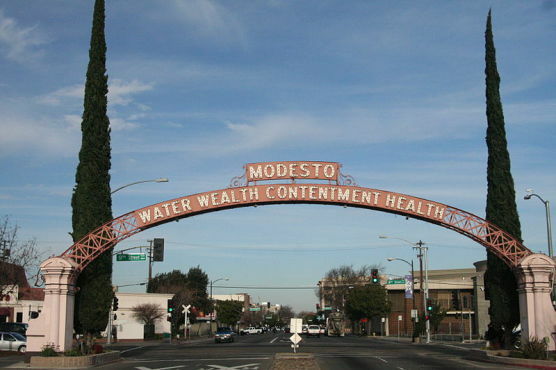 Ever run in the Modesto Half Marathon? Share your impressions here, or post your review in the Comments box below.